We have been waiting for more news on the BlackBerry Q30, aka Windermere. This is supposedly a top-shelf model being designed by BlackBerry, as opposed to the entry-level devices designed and produced by Foxconn. On Tuesday, some new photographs have leaked, along with rumored specs for the unique looking handset. The BlackBerry Q30 features a unique physical QWERTY with no number or punctuation keys showing. 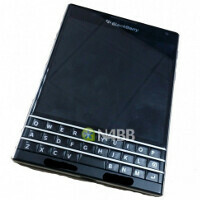 There is a stainless steel bezel similar to the one on the BlackBerry Z10 and BlackBerry Bold 9930. The BlackBerry Q30 will have a 4+ inch screen with a 1440 x 1440 resolution. We are told that the pixel density will be 480ppi. So far, so good. A quad-core Snapdragon CPU is under the hood, with the Adreno 330 GPU handling graphics. The device will feature 3GB of RAM and there will be a 13MP camera on back. A non-removable 3450mAh battery is on board. That should keep the phone running all day. The charger is on the bottom, and like the BlackBerry Z30, there are speakers at the top and bottom. The opening seen at the top of the phone when looking at the back, is used for access to the microSD slot and the SIM card tray. So how does that QWERTY work? Reportedly, it works just like a trackpad does. When you're typing on the QWERTY, swipe from right to left on the keyboard to delete a word. If you are using the browser, switch to landscape mode and scroll up or down by swiping on the physical QWERTY. As you type, three columns will appear, each with a recommended word. You can swipe to the left, middle or right to use one of the suggestions. Will this be the device that saves BlackBerry? We probably will have to wait to see that QWERTY in action before we can even come close to making a judgment. After all, the Sure Press on the BlackBerry Storm was supposed to be revolutionary and make the user feel like he was typing on a computer keyboard. The clickable QWERTY did win an award, but most smartphone users were not impressed. move along hater! you just came here to express your hate, move along please! ahh another blackberry hater, move along tiny mind... move along.. I love phones with sharp edges. It gives a distinctive unique ubiquitous looks and turns head. Though ability uncomfortable to hold, but who cares. Looks to die for. BB main drive is their Keyboard, why would they get rid of it? and the software isn't outdated at all they just lack app support. otherwise BB10 is pretty fluid. But on another point this phone is ugly as hell! If I'd ever buy a blackberry, it would be for the keyboard. Kinda like it. It looks that it's meant to be held with both hands and something tells me it's just right for typing. I would love for BlackBerry to survive, it's just this is not the device. "outdated software" ? it's one of the most efficiency OS today, if not hte most of all. Outdated software?? Please explain what's outdated about BB10..
Fzacek, you have absolutely no idea what you're talking about if you call BB10 outdated. Have you ever even used a BB10 device before? And the BB keyboard is the best on the market. Why would they get rid of it when BB fans love it so much? So you think BlackBerry should make touch screen only phones like everybody else? If HTC is struggling with a quality device like the One M8 what chance does BB have? As far as the OS BB10 is newer and has more potential than any other mainstream OS available. you mentality of keyboards is outdated! move along please! look at your phone, and you will find it, now move along tiny mind! well it's great for pics and instagram ... but for apps and videos it's really bad .. It resembles Sony's edged sharp design, so how could it look ugly?